With summer well under way and temperatures peaking into the triple digits, it’s imperative to stay “cool” while participating in outdoor activities. It’s a no brainer to hydrate, hydrate, hydrate. 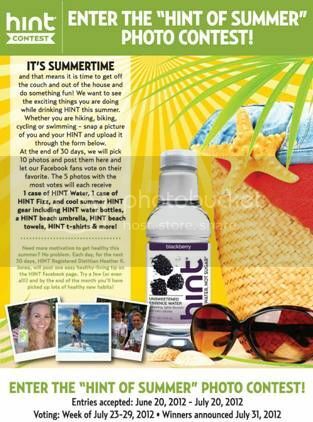 This summer, HINT, a fruit-infused all natural essence water that contains zero calories, sugars, artificial sweeteners and preservatives, is teaming up with registered dietician, Heather Jones, to motivate and encourage people to drink smarter. See HINT's Facebook, Twitter and flyer below for full details. Entries accepted from June 20-July 20; Voting from July 23-July 29th and winners announced July 31st. Disclosure: I did not receive any products nor was paid for this post. I was provided info to share. Any opinions expressed in my review are my own personal and honest thoughts. No other compensation was given.